Miss FD’s 3rd Studio Album – Comfort for the Desolate – Out Now – Chain D.L.K. 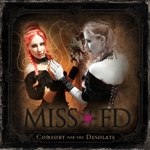 Miss FD’s 3rd studio album, Comfort for the Desolate, is officially released through Quantum Release Records on June 18th, 2013. Comfort for the Desolate is available in CD format through the official Miss FD website, FiXT, and Amazon.com.